Original children's stories, comics, music, animation and links to recommendations for children's stories and illustrated entertainment on the Web. The Candlelight Gallery also displays the work of contributing writers and artists. The graphics are larger than thumbnails and grab attention. Additional animated graphics and banner add appeal to the site. The background is divided into different color, delineating the sections even further. This site comes from Candlelight Stories, a publisher of illustrated entertainment and children's stories. The site itself is not a listing of their products but rather an interactive environment for children to read stories. The site has large, illustrated buttons that make choosing where to go easy for children of all ages. In addition to illustrated Mother Goose and Alice in Wonderland classics, there are original stories from contributing authors and illustrators. 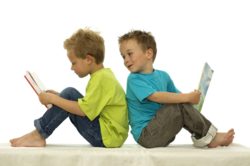 The stories are in a page-by-page format so that children and their parents can read along. Some stories have music to accompany them. There are even games online to play, although currently only certain users can play them (based on browser type). In addition, there is a current work-in-progress that users can add portions of the story via email. The site is a wonderful arena to introduce children to the world of children's books and illustration.